Gold Line Pilates features top-of-the-line equipment and gold-standard instructors to ensure an excellent and customized Pilates experience for every individual. Lauren Bastelli comes to Gold Line Pilates from the San Francisco Bay Area with a background in dance and musical theater. With a BA in Dance from UC Irvine, she continued her education at The Alvin Ailey School in NYC, where she was encouraged to become a certified GYROTONIC® and GYROKINESIS® trainer. She was first introduced to the GYROTONIC® Method through her professional dance career, as a means of cross training, injury prevention and restoring her body from the rigorous physical and mental demands of dance. She quickly knew the GYROTONIC® Method was not only essential to her as a young athlete, but she also knew this work would be essential to anyone from any background. 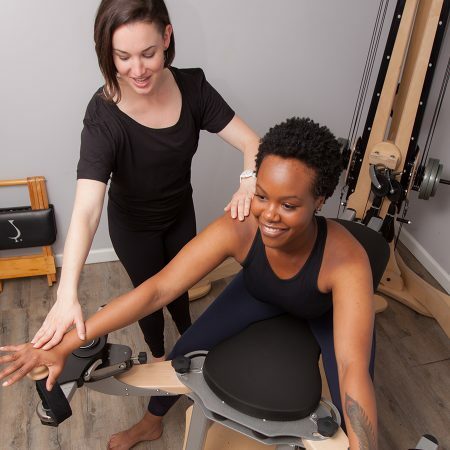 Lauren personally enjoys the GYROTONIC® method as a way to integrate both healing and fitness, and she aims to create an encouraging and attentive atmosphere while teaching. She is passionate about seeing people learn movement patterns that will help them in their daily activities and assist with graceful aging, pain management, and freedom through movement. When not teaching, Lauren loves getting outdoors going hiking or camping, cooking with her husband, and trying out LA’s array of taco trucks! © 2019 GOLD LINE PILATES. ALL RIGHTS RESERVED.